Being fourteen is a minefield: with fashion dilemmas, teacher trauma, embarrassing parents and boy drama, Faith is just hoping to make it through Year Ten without too many disasters. But when she and her best friend Megs sign up to take part in an inter-school choir with the local boys comprehensive, Faith's life gets even more complicated… just how is she supposed to concentrate on becoming the next Cheryl Cole when she's trying to understand how teenage boys' minds work? A brilliantly funny read perfect for fans of Louise Rennison. I'm fully going to admit this is not at all my kind of book and quite honestly the only reason I read it is because I met the author and heard her read an extract and was hooked. The main character Faith has a brilliant voice. She captures that teenager-ness fantastically well and as a result is brilliantly funny without being nasty or over the top. I loved following her story and seeing what she was going to get up to next as I knew it was guaranteed to make me chuckle. What I particularly liked about the book is that underneath it all Faith has a heart of gold and I loved seeing that side of her come out over the course of the book. 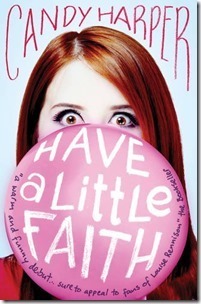 All too often characters like her can be really irritating as far too much but in Faith's case she wasn't which I was eternally grateful for because an irritating whining teen can really put me off a book. I love the sound of this book. I think I need more really funny YA books in my life!